If you want to learn and grow and make a greater impact, it's essential to be a productive risk taker. Not all risks are productive of course, but most people actually make too few mistakes, not too many. 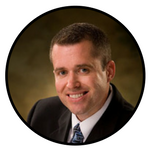 Former IBM President Thomas Watson boldly proclaimed, "If you want to succeed, double your rate of failure." It's through our mistakes that we learn. When we take risks, we either win or we learn. Not win or lose. Win or learn. So how do you become a stronger risk taker? How do you find the courage to step out of your comfort zone and into your growth zone? Here are 7 ideas. Risk taking involves the possibility of failure. Be content with doing your best even if the outcome isn't what you hoped for initially. If you want to grow as a risk taker, take more risks. But don't think they have to be gigantic risks at first. In fact, it's not wise to take larger risks to start. Taking lots of smaller risks helps you gain the confidence, practice, and good judgment to take larger risks eventually. If you spend your time with people who protect the status quo and simply try to stay comfortable, you'll be more likely to do the same. Bring people into your life who are taking risks and living their dreams. It's very difficult to rise above mediocrity if that's what you are surrounded by every day. Seek excellence. And know that when you take risks, it's going to make some people very uncomfortable. There are lots of wild and crazy things you can do that might feel frightening but really aren't that risky at all. You might risk embarrassment if it doesn't work out, but that's about it. Later this year my daughter Maddie and I will be contestants in our community's Dancing with the Stars fundraiser. So although dancing in front of a big crowd is way out of my comfort zone, what's the worst that could happen right? It should actually be fun. And I know it's an opportunity to practice risk taking and just going for it. It might feel safer to just be content with how things are. It might feel more comfortable to just go through the motions. But if you want to grow, you have to step out of your comfort zone. There is always that little voice telling you to play it safe. You have to push past that resistance. I've made it a habit to read and learn and spend time on personal growth at least 5-hours every week. At first, that was very difficult but eventually it became easier. What was uncomfortable as first became comfortable and increasingly valuable over time. 6. Be an Adaptable Learner. Our world is changing faster than ever. The rate of change is accelerating. And since we're not teaching kids from 20 years ago, our classrooms and schools shouldn't look like 20 years ago either. 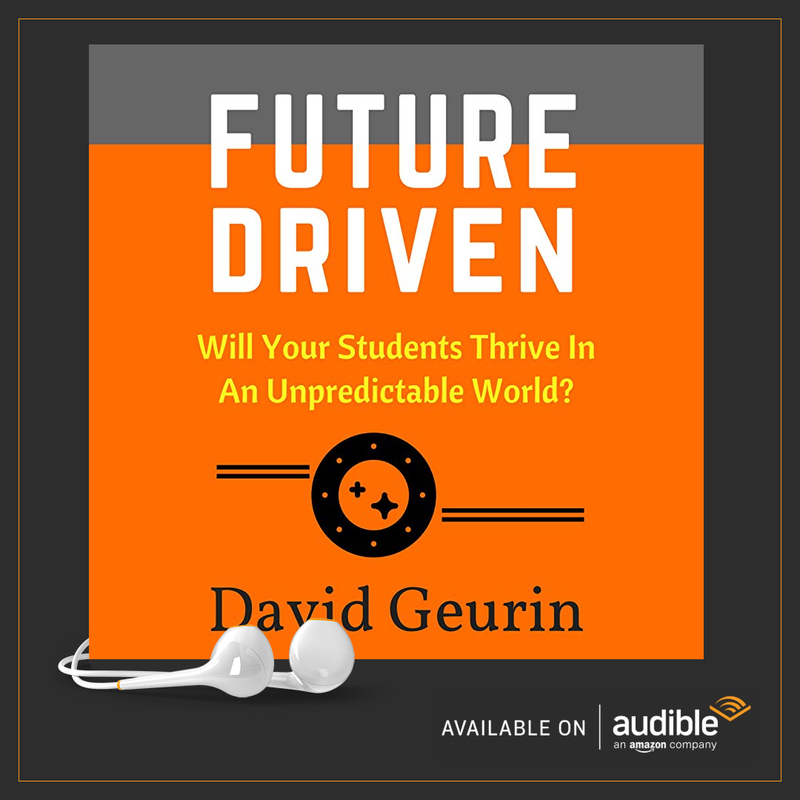 Things are changing so quickly that even schools that are taking risks and making bold moves forward are likely still falling behind. Our students need to see us as adaptable learners. They need to see us model growth, change, and adaptability. No one want to live an average, ordinary existence. Don't sacrifice your capacity for excellence by listening to the voice telling you to settle for less. You can live an extraordinary life and have extraordinary impact. You just have to do it. You have to push through your fears and stop making excuses. 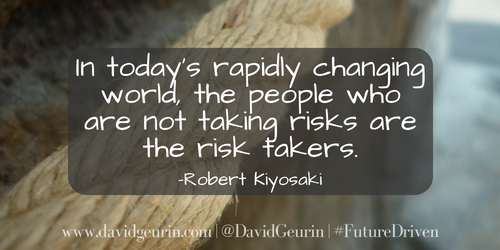 What risks are you willing to take this year? How will you push yourself out of your own comfort zone? I'd love to hear your feedback. Leave a comment below or respond on Facebook or Twitter. Most people get to a certain level of effectiveness in life, work, relationships, etc. and then just hit cruise control. It's normal to just get comfortable and then go with the status quo. The current level of success becomes a sort of boundary they don't cross. They grow content with how things are. After all, things are pretty good. But that's not the way to create continual and extraordinary growth or develop amazing classrooms or schools. For me, I want to be relentless in pursuing a breakthrough or tipping point, where we go from good to great. I want to remove the limits. I believe most people (teachers, students, principals, etc.) have incredible reserves of untapped talent and possibility that goes unrealized. How can we create an environment that brings out greatness? 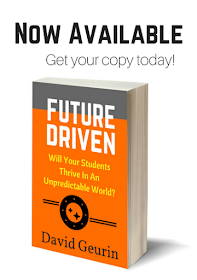 Most schools have tremendous capacity that isn't being realized. The school is the people. And when the people in the school aren't pushing the limits, we settle for much less than is possible. And that's not to devalue the work anyone is doing. It's just saying, I believe in you. And I believe each of us has capacity to do so much more. I want more for you. Our work matters too much to settle for less. Kids are counting on us. There is a future at stake. We can be the difference. Mediocrity isn't being bad at something. Some people get caught up in mediocrity and they're actually pretty good at what they do. They just become content with being pretty good at what they do. Mediocrity is being satisfied with the status quo. It embraces apathy. It’s choosing, either intentionally or unintentionally, to stay the same. Excellence, on the other hand, is not necessarily being good at something. A first year teacher may not be a great teacher yet. They may really struggle. But they can have a relentless pursuit of improvement. They are excellent, not because of their current level of performance, but because they seek growth at every turn. They are pushing their limits. Excellence is always striving to change, learn, and grow. It’s making the choice to get better every day. So don't aim for just good enough. Don't even aim for a little better. Aim for a breakthrough. Set out to be a game changer. 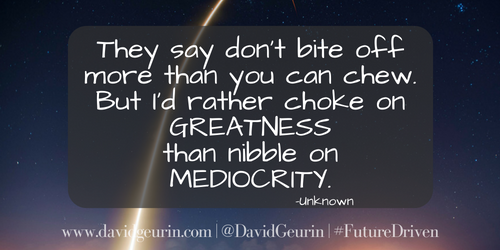 Unfortunately, there are far more examples of mediocrity than excellence. Mediocrity is easy. Excellence is hard. When you notice someone who is doing something with excellence, take note. Learn from them. What will you do this year to aim for excellence and be a game changer in your school? Don't be satisfied with just a little better. Let's push the boundaries and unleash greatness. I want to hear from you. Leave a comment below or respond on Facebook or Twitter.